More on 5G, (thanks to Pete Vandervaal for this link) note the reference to the street lamps & 5G, smart cities. The smart cities are touted as being exponentially intelligent (the old ‘smart’ verbiage is getting a bit worn these days given we know there’s more to anything labeled ‘smart’ than meets the eye). Remember the ex Silicone Valley CE on ‘Take Back Your Power’ telling us ‘they’ labeled the meters ‘smart’ so folk wouldn’t guess how really smart they are not. See the Mayor of Houston pictured there with his Verizon ‘friends’ announcing their plan to roll out 5G. As always giant corporations have the organizations & even nations that are supposed to represent us basically by the short & curlies. Watch The Corporation movie on our Corporations page. A real eye opener. 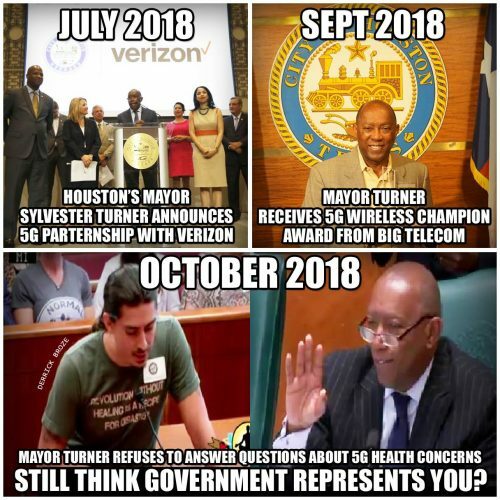 Houston Mayor Sylvester Turner has shown a lack of interest in answering questions from a growing number of Houstonians who are raising concerns about privacy and health issues related to the ongoing roll out of 5G, or Fifth Generation, cellular technology. In July 2018, Houston Mayor Sylvester Turner stood side by side with Verizon Wireless officials to announce plans to roll out 5g technology in the city of Houston. The Mayor said 5G will turn Houston into a “smart city”, with better control of traffic flow, money-saving smart street lights, and driverless cars. On October 1st, Mayor Turner once again held a press event with officials from Verizon wireless. This time, the Mayor and Verizon CEO Hans Vestberg were on location at a Houston couples home as they installed 5G equipment and helped the young couple become “the world’s first 5g customer”. 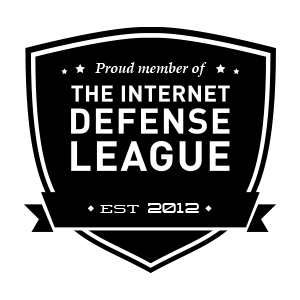 At this event Mayor Turner and Mr. Vestberg were both questioned about the health and privacy concerns which have been raised by scientists, doctors, journalists, activists, and security experts. Both Turner and Vestberg stated they were not aware of any health or privacy concerns. Since that time concerned Houstonians have emailed the Mayor and City Council studies, reports, and articles related to the concerns around the 5G roll out. The few council members who did respond have not provided any details on whether the city conducted an Environmental Impact assessment or any health studies. The city officials have also not answered any questions regarding the potential for invasions of privacy. Why won’t Mayor Turner respond to the concerns of the people of Houston? Does the Mayor’s close relationship with the CTIA and Verizon have anything to do with his silence? Previous PostThe town facing a ‘humanitarian crisis caused by the radiation from state-of-the-art street lamps’: Residents have endured insomnia, nose bleeds and even stillbirths, one local claimsNext PostMystery Molecule in your Baby’s Shots?